Meanwhile we have learned to control the motion of traverse systems. 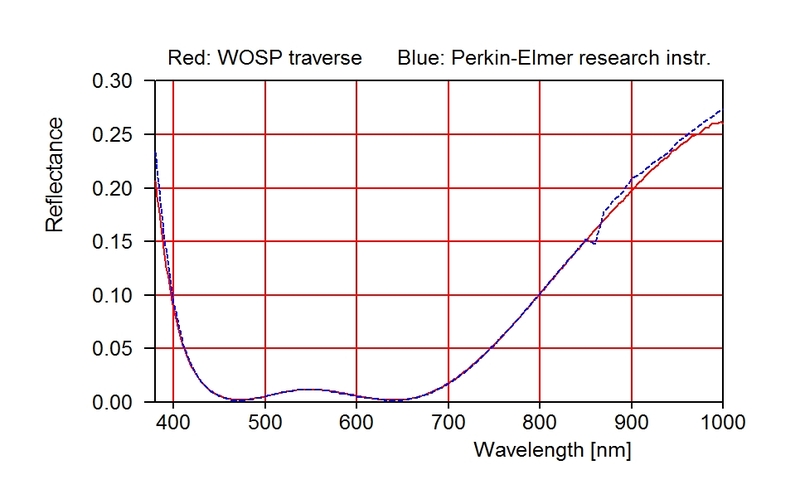 This enables us to record position dependent spectra and generate color profiles as well as thickness profiles. These give valuable information for operators controlling large area coaters. Results are available immediately after production. 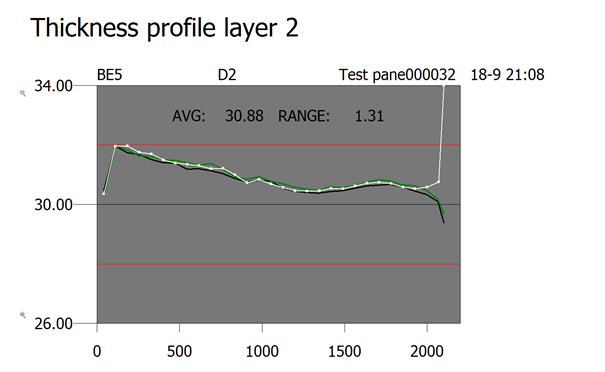 Our first system records transmittance and reflectance spectra (from both sides of large glass substrates) in the range 380 … 1000 nm. Data are recorded with Zeiss MMS1 spectrometers and tec5 electronics. 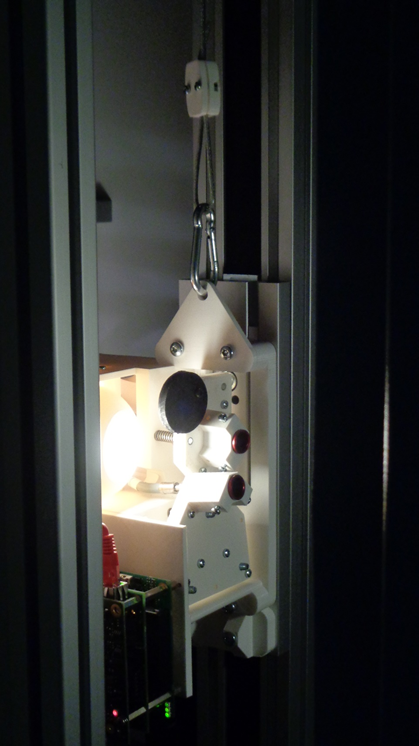 2 stabilized halogen light sources provide the required radiation. 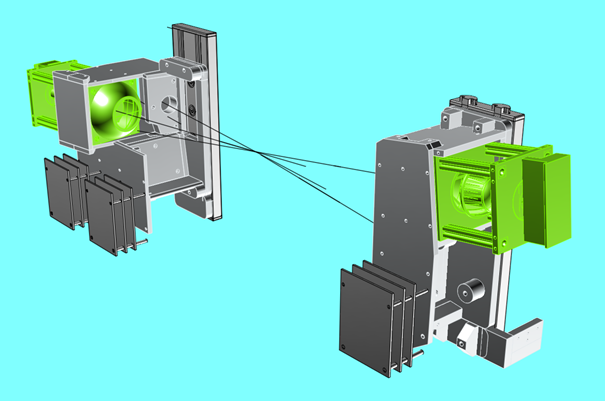 The spectrometer units (including light sources and electronics) are mounted on 2 vertical rail systems (made by ITEM). 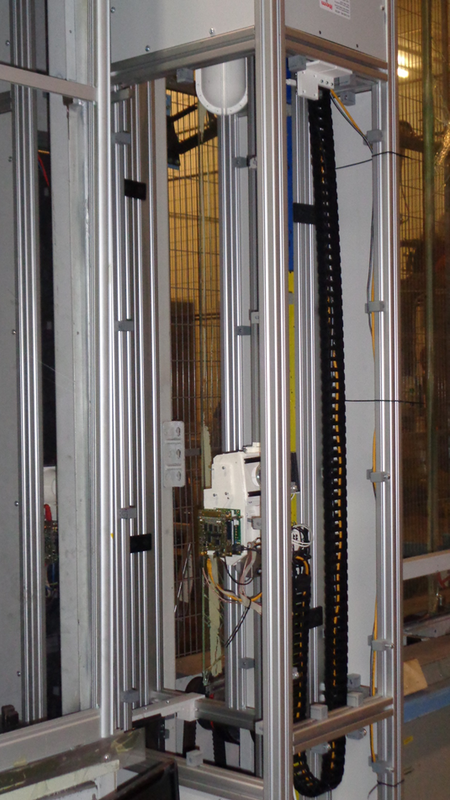 The rail systems are mechanically synchronized and driven by a Trinamic stepper motor. The measuring heads can be positioned at any location on the glass as well as several calibration positions below the glass. The spectrometers as well as the stepper motor are controlled by our CODE software. CODE scripts are used to execute actions like calibration and automatic scans. 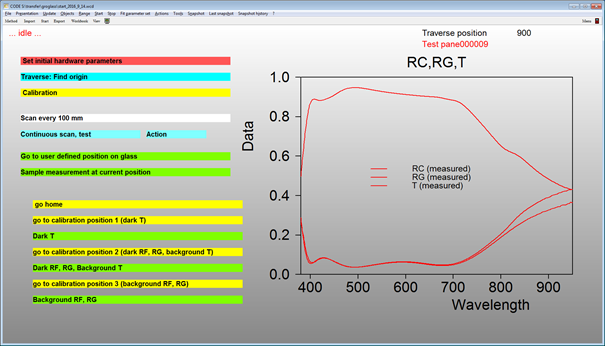 Measurements can be triggered by an OPC connection – in this case CODE provides an OPC client. We can provide similar solutions for horizontal scanning as well, IN addition, we can mount measuring heads for any angle of incidence in the range 8° … 60 °. In the case of light scattering products such as textured solar glass we can provide an excellent measuring system recording R and T using an integrating sphere.